Who was Lee B. Loomis? Lee B. Loomis was an American businessman who founded the Loomis Armored Car Service. Lee Loomis started his business career in the feed business in Seattle, Washington. In 1897, he and a partner decided to try their luck in Alaska during the gold rush. Lee Loomis operated a number of delivery businesses in the gold mining towns of Dawson, Nome, and Fairbanks. It has been said that it was during this period while he was hauling thousands of dollars in gold dust by dogsled that he envisioned a more secure way to transport valuable cargo. 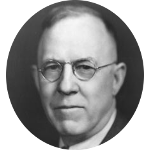 In 1925, he realized that vision when he founded the Loomis Armored Car Service in Portland, Oregon. Lee B. Loomis has a number of U.S. Presidential kin including Millard Fillmore, Ulysses S. Grant, Grover Cleveland, and Gerald Ford. His family tree also includes patriots to American independence such as painter John Trumbull, and signers of the Declaration of Independence Oliver Wolcott and William Williams. Some of the business titans with family connections include P.T. Barnum (Co-founder of Barnum & Bailey Circus), Henry Wells (Co-founder of American Express and Wells Fargo & Co.), J.P. Morgan (Banker), Samuel Colt (Inventor of the Colt revolver), Joseph Glidden (Inventor of barbed wire), and the Wright brothers (Aviation pioneers). Celebrities with family connections to Lee B. Loomis include actresses Lucille Ball, Sigourney Weaver, and Jodie Foster. Actors include Richard Gere, Oliver Platt, Ed Helms, Chris Pratt, and Anthony Perkins. He also has some famous literary kin including Stephen Crane, Edgar Rice Burroughs, and Emily Dickinson.